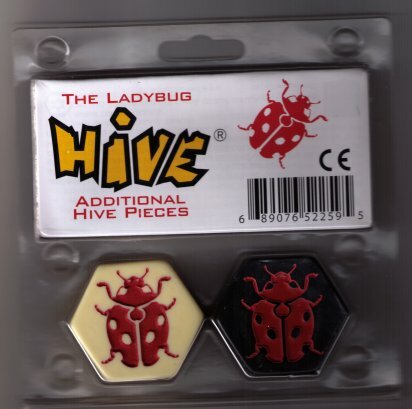 These pieces can be added to the base Hive set and are placed ins the same way as other pieces. Once in play, the Ladybug moves three spaces, two on top of the hive then one down. It must move exactly two on top of the hive and then move one down on its last move. It may not move around the outside of the Hive and many not end its movement on top of the hive. Even though it cannot block by landing on top of other pieces like the Beetle, it can move into or out of surrounded spaces. It also has the advantage of being much faster. This isn't a blow-you-away, change-the-game type piece, simply something to add a little more strategy and thoughtfulness to the play of the game. The Ladybug is a nice, tactical little piece. Great addition! I finally got the Ladybug Expansion. It's a decent expansion piece. Any variety to keep the games different from one another are good and the 2-up, 1-down movement of the Ladybug is different enough to make it feel like it's own unique addition to the strategy. This is a must pick up piece for your hive. The lady bug brings in a unique movement giving you more to work with.